The entire schedule of Valentine week with rose day to Valentine’s day has been mentioned below. Even, in this article, you will get to know which gifts will be best suited to different valentine’s day for girlfriend, boyfriend, husband, and wife. The year-long wait for all the love bugs is over as we have already entered into the month of February. And, we all are just a few days away from Valentine's day week. Every day of this week, starting right from 7th February is an opportunity to cherish the togetherness and love. These 8 days are only the chance to make every moment with each other unforgettable. So, if you are eager to know days list before valentine day then, you've landed on the right page. Because here we have prepared a valentine day list 2019. Besides this, you can also find the best-suited gift ideas for each valentine weekday. Moreover, look out for the latest valentines day offers 2019 and coupons, to get the best gift for your sweetheart. The loveliest time of the year, Valentine’s week or love week. From 7th February to 14th February the whole week has been dedicated to the celebration of love. So, if you’re curious to know about the days' list before valentine day, then check out the table which showcases the rose day to the valentine day list. Rose day holds the first position in the valentine’s day week list. In this day couples present red rose to each other to show affection, care, and passion. There are numerous online websites from where you can buy a bouquet of rose at very reasonable rates. Even, you can accompany the roses arrangement with a heartfelt message to make your love of life feel more special. Propose day takes the second place in February valentine day list. It is the most romantic day of Valentine’s day week because lover’s get chance to confess love in front of their partners. Even, this day is a golden opportunity for singles as well. They can tell about their feelings to whom they like or love. I think the proposal will get better if you accompany with a gift. Check out the ideas are given below. The next day to celebrate in valentine day 2019 date list is Chocolate day. There are no women who don’t relish the chocolates. Even, most of the guys have an incurable sweet tooth then gifting a hamper of chocolates will definitely be going to melt their heart away. It is the appropriate day to appeal your loved one sweet side. So, gift a handmade chocolate package or Ferrero rochers hamper or any specific type of chocolates that your partner craves for on this day. The next day to celebrate the love in valentine day 2019 date list is Teddy day. This fourth day of valentine’s week is dedicated to that person whose tenderness and prettiness always wins your heart. On this day, make your partner happy by presenting him/her a cuddly soft and cute teddy. You can gift teddy bear to your girlfriend or boyfriend with chocolate, flower, truffle cake, and a handwritten note. So, all the lover birds it's time to gear up and show how deeply you are in love with that special someone on the next valentine week day. 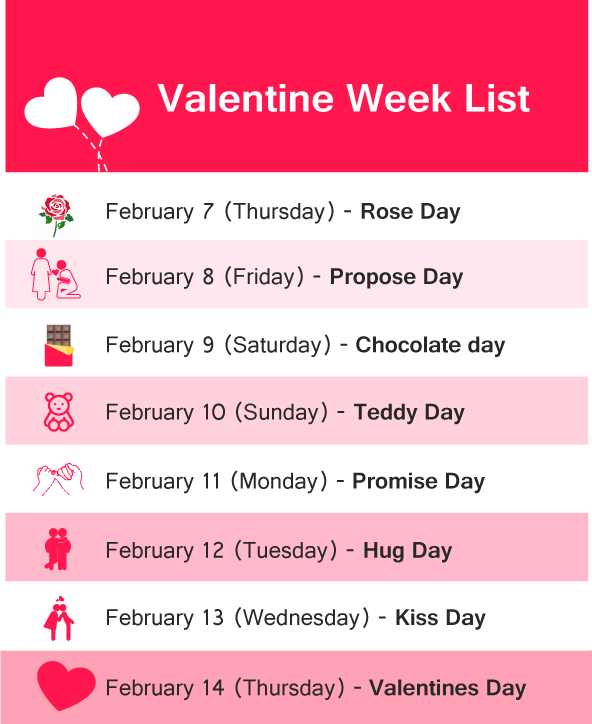 Promise day falls at the 5th position of Valentine day week list 2019. On this, day lovers promise each other that they will always be together in every thick and thin of life. Make the day more special, by sending your promissory note along with flowers or chocolates. Hug is a common gesture to show your affection and care to whom you love. The 6th day in the list of valentine day week has been saved for the hug day. Uplift the excitement of this wonderful day by giving some gift to your partner along with that warm hug. Cushion or customized gift can be an endearing gift option to consider on this day. According to valentine day schedule list, Kiss day is celebrated on 13th February 2019. The day is cherished by lovers all over the world as they depict their true feelings by exchanging kisses. Because it is the only expression of love via which we can make that special person feel more special and loved. Pump up the vibe by gifting a special heart-shaped flower arrangement or the pack of handmade chocolates. Last but not the least day of happy valentine day week list is Valentine’s day itself. The day holds immense importance in every couple’s life. Because on this day they come together to celebrate the essence of love and romance with some beautiful gifts. If you want to make the day special of your special someone, then here is a tip. Give a romantic start to your day by sending a bouquet of fresh flowers. As the day proceeds you can give her/him love note comprising of 100 reasons why you love him/her. Later in the evening, surprise him/her with a heart shape velvet cake and personalized gift. The month of February brings excitement, romance, and love into the heart of couples. As, we have already entered in this month, from 7th to 14th February the world will celebrate the valentine’s day week. Each day holds a special significance as you have read above. So, start making plans and take one romantic step on this valentine’s day week.